Looking for a premium residential property in Bangalore? Are you fascinated to have a home amidst greenery and nature? To make your dream come true, book your apartment in the premium residential project – Salarpuria East Crest in the East of Bangalore. It is a marvelous project in K R Puram at Old Madras Road and crafted with world-class amenities. Salarpuria Sattva’s premium residential development, East Crest represents all that one looks in a dream home. With an aim to provide every comfy to the residents, the group has been able to mark a different place in this sector. The master plan of Salarpuria East Crest reveals artful craftsmanship. Spread across 6.6 acres of land and enveloped in the absolutely alluring green and open campus, there are 11 towers of G+15 height. It houses 1, 2 and 3 BHK apartments embellished with choicest of high-end interiors and specifications. The size of 1, 2 BHK apartments varies from 598 to 1264 sq. ft. where as the 3 BHK apartments lie in the range of 1404 sq. ft. to 1530 sq. ft. All in all, these homes are comfortable, luxurious and designed in a way that you will be proud to own them. The wide windows of the apartments open up a dream view of landscaped gardens and nature. You can make most of your sittings in the spacious balconies to enjoy nature. With its central courtyard, stylish amenities and manicured lawns, East Crest offers a secure and comfortable living to the residents. Salarpuria East Crest Old Madras Road is sited away from the chaos of the city, a place that makes everyday special. Located in the prime location of Old Madras Road, the project enjoys easy access to all the points of interest located in and around the city. The location is also witnessing a major infrastructural revolution. The project is in close proximity to a number of schools, colleges, IT companies, malls, Banks and ATMs to make your life more convenient and comfortable without spending hours in traffic. It lies just before Budigere Cross and right at the junction of evolving Eastern IT Corridor. 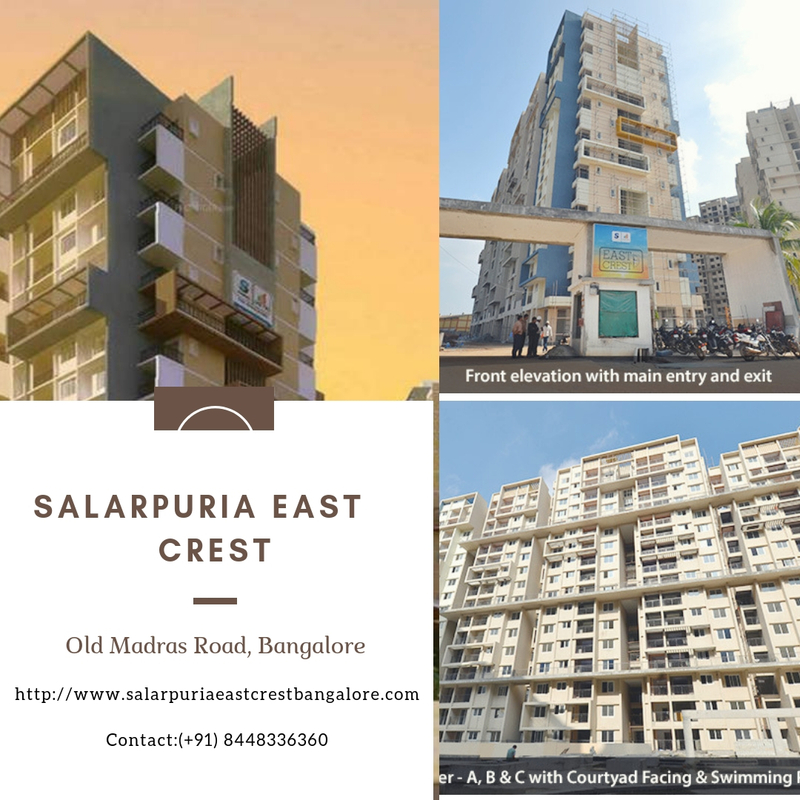 Salarpuria East Crest Price is reasonable, and the rate is fixed to Rs. 4890 per sq. ft. irrespective of the size of an apartment. The price range of these beautiful homes lies between Rs. 29.24 lakhs to Rs. 74.81 lakhs only. The apartments in the township are completely affordable and pleasantly located. Your home reflects your personality. 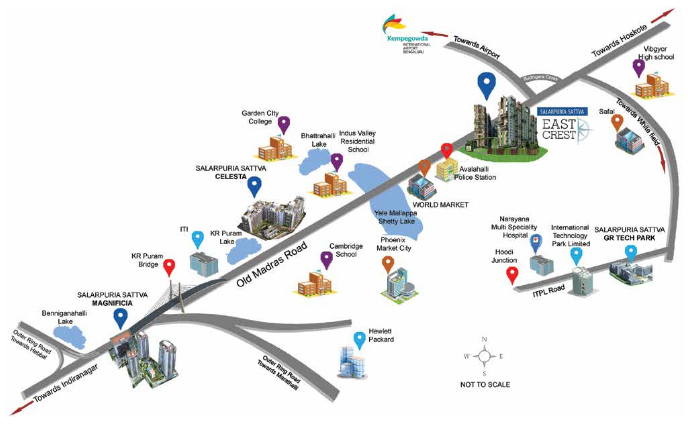 So, make the right choice and explore your dream home at Sattva East Crest Bangalore. Structure - R.C.C. framed structure with porotherm block walls. Located at Old Madras Road, Bangalore.